Filming the wedding of Cully Barnaby had a special poignancy for executive producer Brian True-May. "We decided to use St Mary's Church in Denham, Buckinghamshire, which is the church where my wife Maureen and I got married in 1969. It was an easy choice because it's very picturesque, in a little village, close to Pinewood with no through traffic. "The approaches to the church are lovely, including the beautiful Elizabethan house where my great friend Sir John Mills used to live, and he is buried in the churchyard there. The church hasn't really changed since our wedding nearly 30 years ago and neither has the village." Brian and Maureen even make a small appearance in the episode alongside their granddaughters. "Maria and Olivia play Cully's bridesmaids and Maureen and I are standing at the church door as Cully arrives. We don't make a habit of it, in fact the only time I've ever been on camera before was many years ago when Barnaby was seeing Cully off on a Greenline bus and someone had let the extras go early." Adds Brian: "The wedding itself is only a small part of the episode but it was fun to do and as so many members of the press were interested in it, we invited them along to be in the congregation!" Since filming "Blood Wedding", Brian and the team have gone on to complete the 11th series of Midsomer Murders and are now starting work on the 12th. Brian is delighted by its ongoing popularity. "When I first read the books by Caroline Graham I could picture all the locations and I think that's what viewers like too. It might not be edgy, contemporary drama but it's relaxing entertainment with interesting characters and people come back time and time again to watch our films. "We've had four or five Barnaby houses and several police stations, but nobody has noticed that they look different. Because we've filmed over 130 hours of drama, it's inevitable that some of the locations are the same but we shoot them from different angles and nobody ever comments." Even the Queen has an interest in the series, as Brian discovered recently. "I met the Queen and the Duke of Edinburgh in November at the opening of Pinewood's new entrance. She asked me all sorts of questions and whether anyone else was going to be killed. I told her that we'd despatched around 150 victims but there were still more to go!" He adds: "We've also been asked for some footage by the government as part of its drive to promote Britain around the world as the home of creativity and innovation. "They are putting together a film to showcase the nation at the Beijing Olympics and we hope we will be part of it. I think the view of England that Midsomer Murders represents is very popular with people in other countries." Future episodes see Barnaby taking his investigations over to France. "For series 12 we're planning to go to the lovely fishing port of Honfleur which doubles as a town twinned with Midsomer. We're also doing an episode set in a golf club and another which delves into art fraud. If you set an episode around a particular activity it works well. Clubs like golf or sailing or rock climbing are microcosms of society." 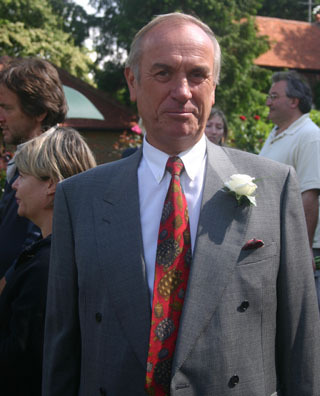 Hundreds of actors have appeared in the series since it began in 1987, representing the crème of British talent. Says Brian: "A couple of years ago we started 'recycling' actors and inviting them back to play different characters, which they are very happy to do. For example, we were delighted that Ronald Pickup, Serena Gordon and Maggie Steed agreed to come back for these latest episodes. "We also have a list of dream actors we'd still like to have. Apparently Johnny Depp and Roger Moore are interested and I asked Michael Caine when I met him and he didn't say no. It would be great to get him in a cameo role, maybe in an episode together with Roger Moore representing opposing factions in the village!" The 12th series of MIDSOMER MURDERS is now filming until March 2009.